I’ve mentioned my side dish issues before. I’m in an even worse rut when it comes to starchy sides. I’m the only one who really likes rice or most pasta side dishes so I make a lot of plain Jane mashed and fried potatoes. These were a great change of pace and were a hit with the entire family. Place potatoes and garlic in a large pot. Cover with water and add the hefty pinch of salt. Cover and cook for around 30 minutes or until potatoes are fork tender. Drain and place back in pot. Add butter and roughly smash potatoes with a potato masher or a fork. It should be somewhere between a baked potato and traditional mashed potatoes in consistency. Sprinkle in the herbs and stir gently to distribute throughout the potatoes. Add additional salt, pepper, and butter if desired. Sign up for updates via email or RSS . It’s free and easy. I hate to admit that I’m a carb-junkie! 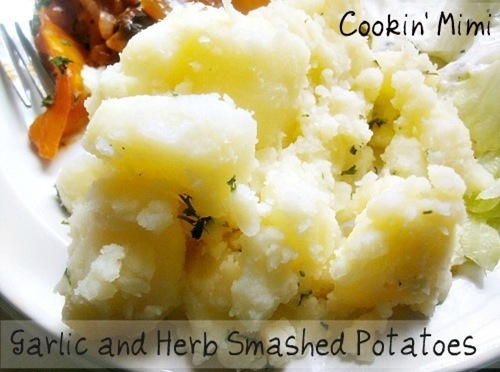 Your Garlic and Herb Smashed Potatoes sound yummy! Thank you for sharing at All My Bloggy Friends last week. I can’t wait to see what you share this tomorrow! Thank you for sharing on Tasty Thursday last week!